Philippine Atmospheric, Geophysical and Astronomical Services Administration said on its official twitter account that the gateless La Mesa dam in Quezon City has reached its spilling level at 80.15 meters. 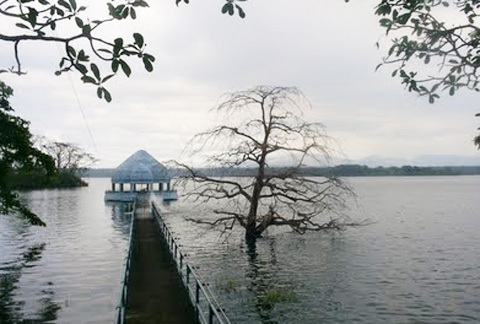 PAGASA said that the water level at La Mesa dam was already at its spilling level of 80.15 meters, as of 6 a.m. advisory. PAGASA advised residents near Tullahan river in Barangays North Fairview, Sta. Lucia, Fairview, Novaliches Proper, Capri, Nagkaisang Nayon, Gulod, Bagbag and San Bartolome to evacuate now for their safety. While the Ambuklao, Binga and San Roque dams were also releasing water as of 6 a.m. Today, according to PAGASA. Updated - August 7, 2012 : 6:00 a.m.
"As of 9:15 p.m. last night, the water level was at 80.21 meters or above the spilling level of 80.15 meters, forcing La Mesa management to release water into the Tullahan river." Comments or suggestions about "La Mesa dam reached spilling level water at 80.15 meters" is important to us, you may share it by using the comment box below.